Using muscle modelling and more standard hydrodynamics, it seems computers have caught up. If locomotion drove evolution in the same way as it seemed to drive the industrial revolution, ignoring the efficiency of an animal's metabolism, these models of marine animals could almost be the real thing. The mackerel family, including tuna tend to be regarded as the fastest alive, but compare the dynamics of a dolphin or an orca, with those of the accelerative pike or the salmon jumping upstream. Lamprey and eel shapes seem to cause the modelling more difficulty than the original modeller, but the results are very impressive on tuna or rainbow trout, for example, as shown in mathematical detail in this extract! 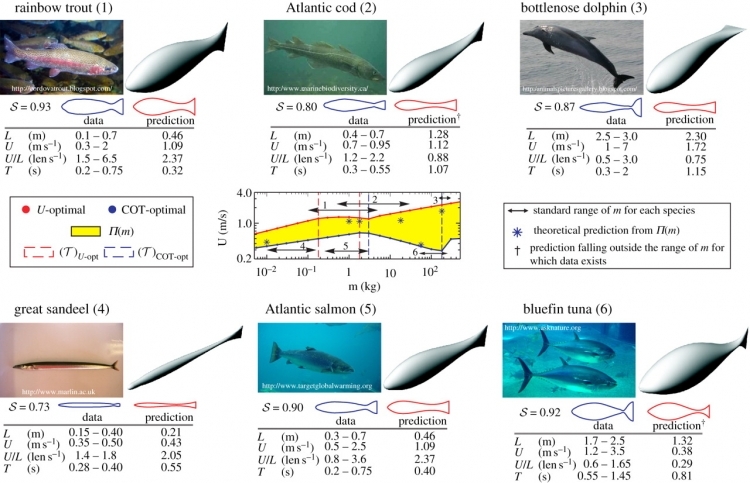 Comparisons of shape and swimming characteristics between model predictions and representative fish and cetacean species. In each example, from optimal populations that cover the species' standard range, an organism is selected that best matches kinematic data and shape for that species are. Three-dimensional shapes of theoretically predicted organisms are depicted alongside photographs of real swimmers for qualitative comparison. The body shapes of each species are outlined neglecting the fins and the trailing profile of the tail (blue line) and quantitatively compared with the predicted shapes (red line). It's really interesting to make these comparisons between real animals and their predicted shapes, in the fearsomely-fast tuna for example. It turns out exactly as predicted. Really hydrodynamic, as it has to be to catch all those other fish. So the morphology of a tuna has been adapted from its ancestors in specific and, now, measurable ways. Whether we can now design swimming vehicles is a point the authors make, but the impact of this study on extinct species' abilities could be useful in many different researches too. The full research paper has been published in the Proceedings of the Royal Society B: Biological Sciences today.